I had for a long time tried to view a male moose up close, with little success. Several times I had met cows with their offspring, but never a bull. 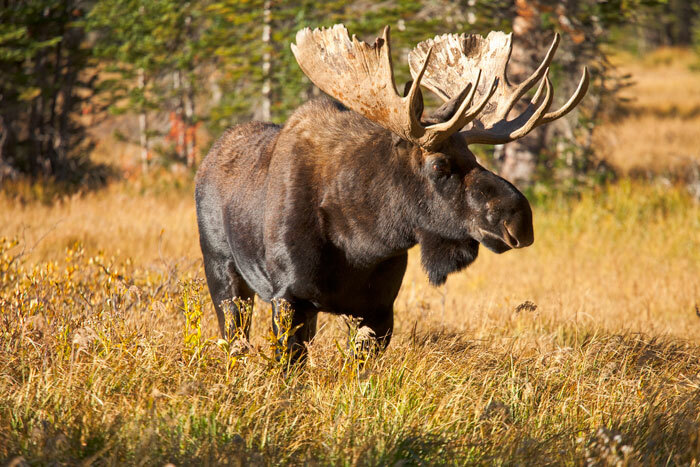 Moose are the largest extant (still alive) species of the deer family, and can be easily distinguished by the characteristic antlers of their bulls, which resemble palms. Unlike other deer, they are mostly solitary, spend most of their time feeding in shallow waters, and can be very aggressive if startled, especially during their autumn mating season. It was a transition day for me, one of those in which you are just too tired from the rigors of previous days, and you just want to wonder around enjoying life while your body recovers. It was approximately an hour after sunrise, and I had just entered the wilderness for an easy hike. The air was cold and I was walking with my hands in the pockets, while not paying that much attention to the easy path and worrying about my own business. After a turn, I suddenly I came up against this huge animal blocking my way, so close that a couple more steps and I would have crashed into it. It was enormous, seemed annoyed at my presence, and I awakened instantly knowing that I was in trouble. I looked up to him in awe, he looked down to me in disgust. I thought "oh man", I guess he thought "oh, poor boy". I slowly backtracked, he did not move an inch. Then I thought this was my lucky day, although I have no idea if he agreed or not. After putting myself out of his view, I reacted quickly, loading the telephoto and the extender and unfolding the tripod. I tried to guess the route he was taking, and ran to make a detour out of his view and position myself so that he would come into me. This was moose territory, and I soon found myself in flooded grasslands with water above my ankles, but I was able to find a few trees to hide behind and wait. Just as I got ready the moose started coming in my direction, getting as close as 20 feet without paying me any attention at all. I started shooting bursts like crazy before he moved on after around a minute. I then tried to repeat my strategy but he moved too fast in such a terrain and I could not keep up, so I finally gave up and happily continued the hike with a smile in my face.